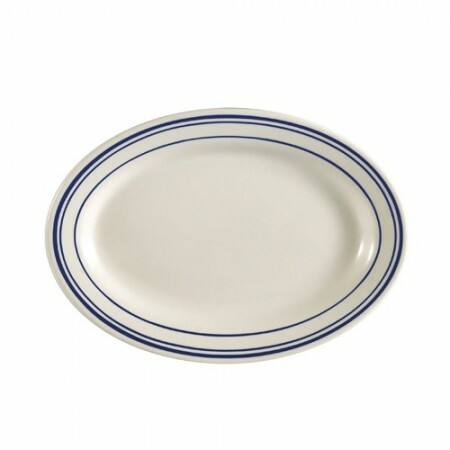 Use the CAC China BLU-14 Blue Line Rolled Edge Oval Platter 12-1/2" x 8-5/8" to serve your customers grilled chicken, fish. or any other entree from the menu. Featuring blue bands along the rims on American white, this charming platter will make any dish look more appealing. Crafted from American white stoneware, this platter is oven, microwave and dishwasher safe, making it the right choice for cafes, hotels or restaurants.